This movie reminds me of waiting through countless role calls during school, and I was that squirmy, but quiet kid who couldn't stand it. So I vowed when I started teaching I would figure out an easy and painless way. When I take attendance it’s a silent activity as I will do enough talking over the day. Students are already seated and working while I briefly check over my seating chart to see who is missing from their seats that day. I also count my students just to be extra sure I haven’t missed anyone. Then I log onto my computer to submit any tardies or absences. Sounds easy cheesy right? Well it is supposed to be, but I admit I often get carried away with the day if all my students are present and then I get a call from the office, kindly reminding me to submit attendance. This leads to the next conundrum. 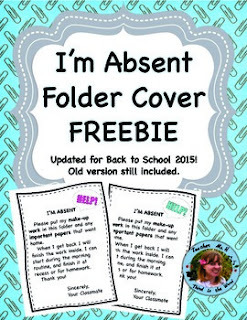 How to manage getting assignments and papers to absent students without tearing your hair out. An easy solution I came up with long ago was a special folder that gets placed on their desk by a student helper when I take attendance each morning. 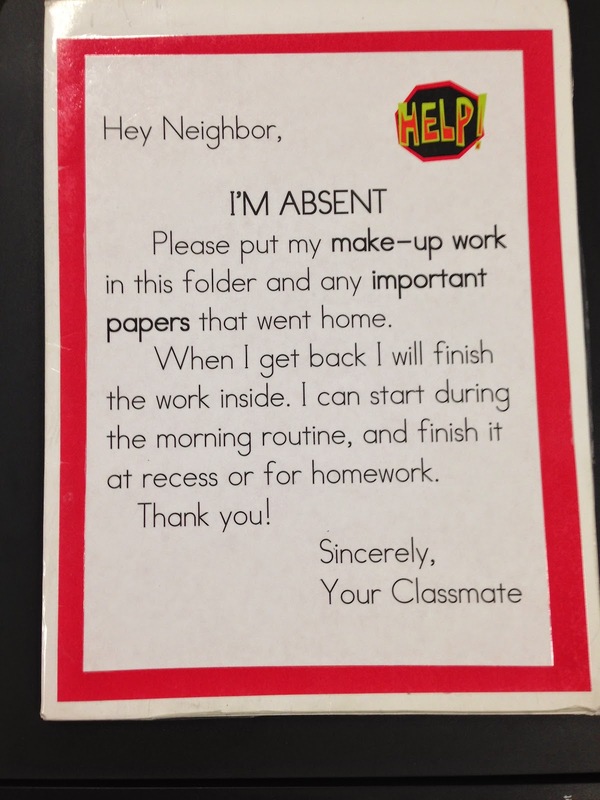 Through the day as items are passed out, neighbors adjacent to the absent student are responsible for adding the papers to their folder. When the absent student returns the folder is still on their desk with all the papers that were handed out while they were gone. I designed this special message and graphic to place on plain folders that I laminated. And just to say a big THANKS for being an awesome teacher you can download it for free at my store on teacherspayteachers.com. Just click here. Also everything in my store is 20% off as part of Teacher Appreciation Week on TpTs site-wide sale May 6 & 7th with an additional 10% off if you use the code below. That's 30% off!!! Just type in TPTXO at check out, on the already sale priced items.